An atrial myxoma is a noncancerous tumor in the upper left or right side of the heart. It most often grows on the wall that separates the two sides of the heart. This wall is called the atrial septum. A myxoma is a primary heart (cardiac) tumor. This means that the tumor started within the heart. Most heart tumors start somewhere else. Primary cardiac tumors are rare. Myxomas are the most common type of these rare tumors. 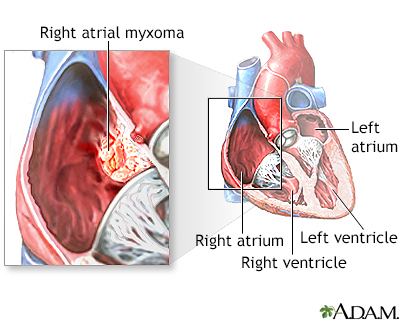 About 75% of myxomas occur in the left atrium of the heart. They most often begin in the wall that divides the two upper chambers of the heart. The rest are in the right atrium. Right atrial myxomas are sometimes linked with tricuspid stenosis and atrial fibrillation. Myxomas are more common in women. About 1 in 10 myxomas are passed down through families (inherited). These tumors are called familial myxomas. They tend to occur in more than one part of the heart at a time, and often cause symptoms at a younger age. Symptoms may occur at any time, but often they go along with a change in body position. 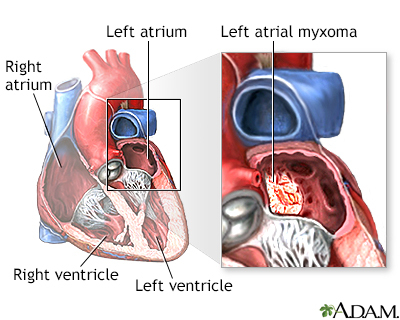 The symptoms and signs of left atrial myxomas often mimic mitral stenosis (narrowing of the valve between the left atrium and the left ventricle). Right atrial myxomas rarely produce symptoms until they have grown to be quite large (5 inches wide, or 13 cm). The health care provider will perform a physical exam and listen to your heart through a stethoscope. Abnormal heart sounds or a murmur may be heard. These sounds may change when you change body position. Surgery is needed to remove the tumor, especially if it is causing heart failure symptoms or an embolism. Some people will also need the mitral valve replaced. This can be done during the same surgery. Myxomas may come back if surgery does not remove all of the tumor cells. A myxoma is not cancer, but complications are common. Untreated, a myxoma can lead to an embolism (tumor cells or a clot that breaks off and travels in the bloodstream). This can lead to a blockage of blood flow or even cause the tumor to grow in another part of the body. Pieces of the tumor can move to the brain, eye, or limbs. If the tumor grows inside the heart, it can block blood flow. This may require emergency surgery to prevent sudden death. Lenihan DJ, Yusuf SW. Tumors affecting the cardiovascular system. In: Bonow RO, Mann DL, Zipes DP, Libby P, Braunwald E, eds. Braunwald's Heart Disease: A Textbook of Cardiovascular Medicine. 10th ed. Philadelphia, PA: Elsevier Saunders; 2015:chap 85. McKenna WJ, Elliott P. Diseases of the myocardium and endocardium. In: Goldman L, Schafer AI, eds. Goldman's Cecil Medicine. 25th ed. Philadelphia, PA: Elsevier Saunders; 2016:chap 60.